*note: one flavor, Salted Caramel Core, was not available at the store but will be added to the study when made available. Peanut Butter Fudge: This pint possesses half peanut butter ice cream and half chocolate ice cream with mini peanut butter cups and a peanut butter fudge core —think of Reese’s in ice cream form. While it’s incredibly tasty and plays upon a classic flavor profile, I wish there was something more exciting about this. It just seems like it’s been done. The core didn’t add anything to the mix, but only reinforced the flavors already present. While this will speak to any peanut butter lover, nothing about it screamed remarkable. 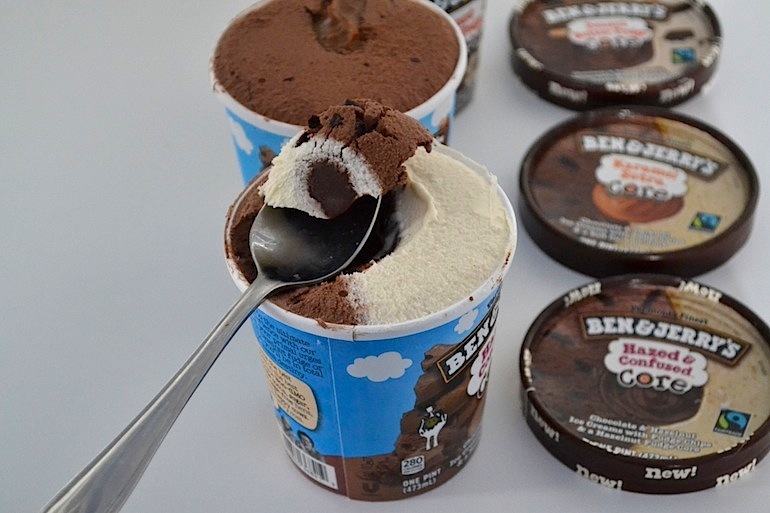 Hazed & Confused: This pint packs together hazelnut and chocolate ice cream with fudge chips. A hazelnut fudge core binds them together that tastes like a more intense and frozen version of Nutella. 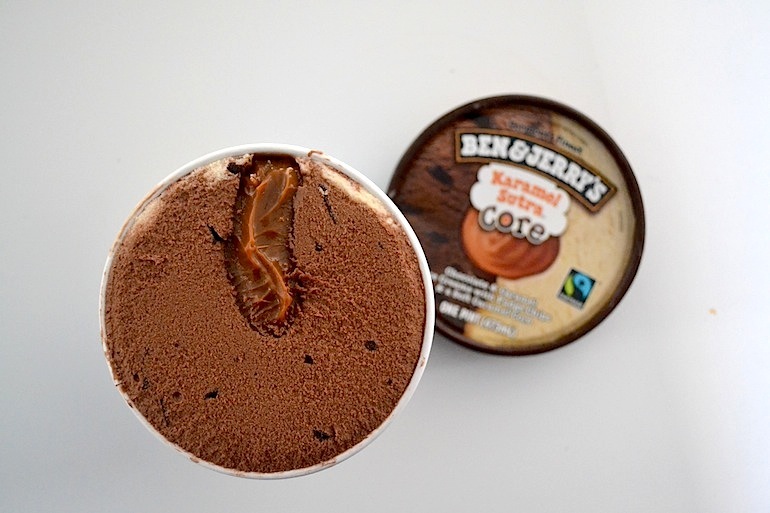 The core blends nicely with the chips in the chocolate, but you’ll need a glass of water to handle the impact overload. 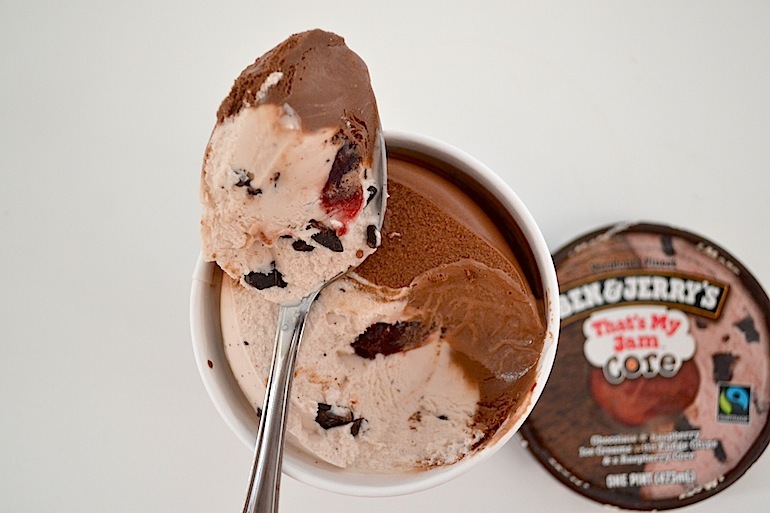 It’s decadent and dreamy, and the hazelnut ice cream, while certainly rich, seems to lighten the chocolate. It’s that perfect nutty chocolate combo you always dream of, but the core was too firm and somewhat difficult to scoop and incorporate with the ice creams. That’s My Jam: To be honest, I was most skeptical about this one. 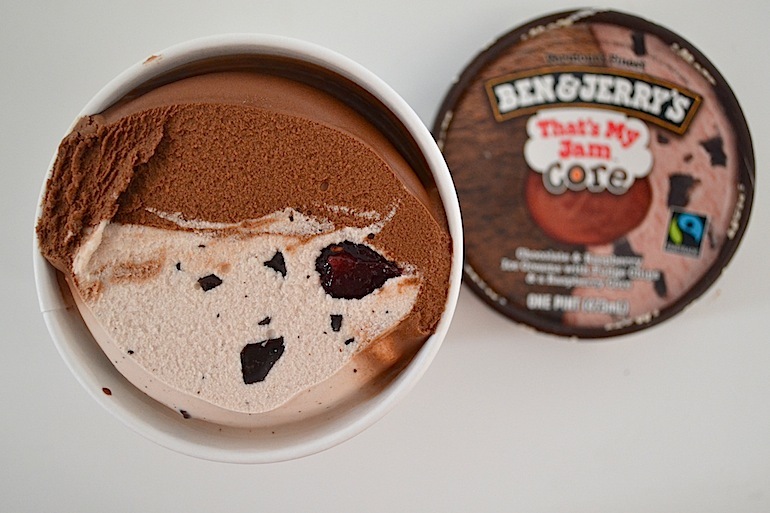 The idea of frozen jam bringing raspberry chip and chocolate ice cream together, while seemingly appealing, just kind of turned me off. I think the idea of frozen jam was what was putting me off, but man was I wrong. This is one of the only cores that serves an actual purpose. It’s consistency is soft and somewhat gooey and truly adds a new element that heightens both the chocolate and raspberry flavors. I’d like quarts on quarts of this in replace of chocolate covered fruit any time. 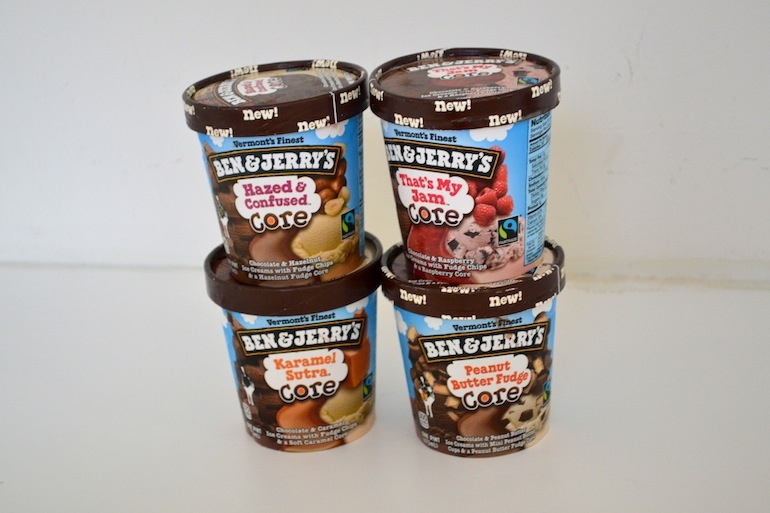 Karamel Sutra: I was unaware that Ben and Jerry’s had actually been making this baby for a while and its popularity is most likely what inspired the line. One taste, and you’ll know why. A silky caramel core ties together caramel and chocolate ice creams. The center is what sealed the deal for me as its texture was surprising and impressively soft for being frozen. Think of eating dulce de leche and hunting for the ribbons of caramel. In this case, no hunting is required because a giant streak of the substance is sitting smack in the center. While it might seem like a caramel overload, the core carries a more intense flavor than the ice cream, and the two blend together effortlessly. 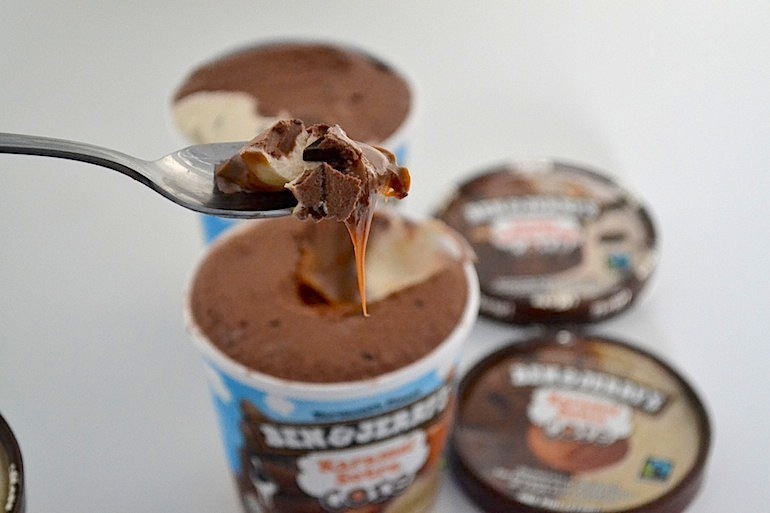 It’s a dream and a half and will most likely have a permanent place in my freezer. CONCLUSION: I WANT MORE CORE. 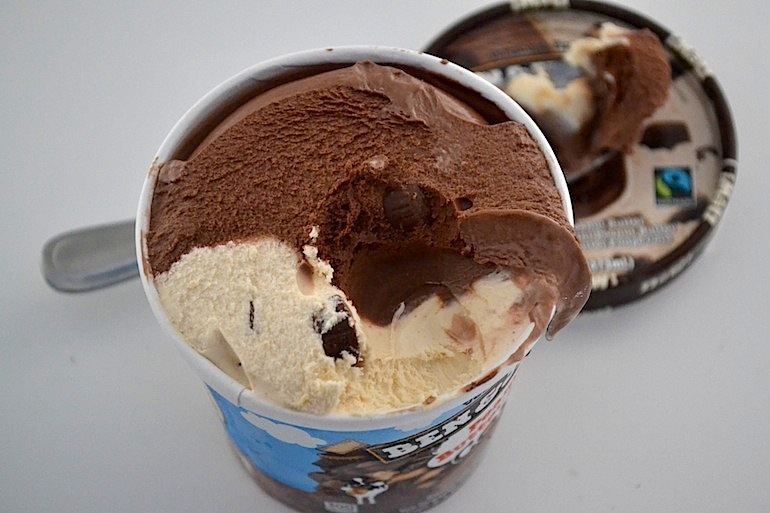 I can’t wait for Ben & Jerry’s to roll out more flavor combinations that tie together some of their more wild and intricate ice creams. While seemingly delicious, they’re playing it safe, but for now, I guess I’m content.